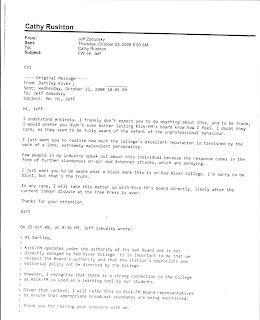 In her first "this has to be kept confidential" email about Marty Gold to Red River College president Stephanie Forsyth, thin-skinned Winnipeg Free Press editor Margo Goodhand not only used the comments of the in-house attorney about the misleading information she gave him to bolster the righteousness of her grieveances; she also made an unsourced reference to her own staff having been given the bum's rush when they tried to have concerns addressed. "I do know that individual reporters who have complained to Gold and his station boss have been dismissed." Both publisher Bob Cox and Goodhand had been invited onto TGCTS a number of times to discuss the newspaper's role in the community and reporting. They declined. The email did not mention that fact to Forsyth. Columnist Dan Lett made two extensive appearances in studio. Other FP writers were also interviewed on TGCTS. No mention of their taking part in the program was made to Forsyth either. Only one Free Press reporter is known to have complained to Kick-FM station manager Rick Baverstock. 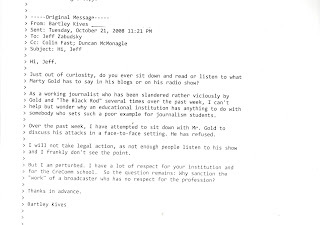 And what Goodhand also failed to divulge to Forsyth, was that Bartley Kives had first blazed the trail to the door of the RRC Presidents' office to attack the voices of the community being heard on the campus radio station-- or how Kives was rebuffed by Forsyth's predecessor, former radio journalist Dr. Jeff Zabudsky. Which only goes to show, freedom of the press to report and comment on the public, does not extend to freedom of the public and union members to the same consideration, when it comes to the Free Press strike committee. "The decision to moderate comments at freepressonstrike.com was made after someone posted racist statements. You would know that, had you bothered to ask." But that reason isn't what Kives had told the public. Please direct me to the part that references the need to filter out racist statements. That's precisely what I posted, Marty. But I'm telling you the truth. You can choose not to believe me, but ask around: I don't have a reputation for lying. To be frank, I'm extremely upset with you, because your post is remarkably unfair (as I'm sure you are aware) and quotes Aldo's (nutty) e-mail out of context. How may I reach you? We need to talk. I refuse to believe anyone could be as malicious as you sounded in that post. bart"
First thing Monday morning, Kives checked his email and tried again. You didn't get back to me. When can you and I meet? I would appreciate the opportunity to speak face to face. How about tonight, after my picket shift ends? Coffee? You outright stated that I was "wrong", yet you admit that the root of my blog post - ie how I read what you wrote on the website - was accurate. You then attributed malice to my writing. I suggest you rethink the language you used to attack me before offering a cordial invitation for coffee. Facing proof he had no legitimate beef about the story, Kives became even more insistent on a personal meeting with Marty Gold asap. Marty, I made no attack, and I think we both know who owes who an apology. Only one of us is out to smear the other — and that person isn't me. So are you going to meet me or what? I want to speak to you in person. Or are you afraid of meeting me? I'm a little guy, so you don't have much to worry about. I'm actually quite nice. When the "little guy" didn't get an answer about his coffee date fast enough to suit him (or maybe he was just bored, as the only working journalist involved in the conversation at the time was not him), on Tuesday night Kives fired off an email to Zabudsky. He also copied it to 2 College officials, one of them his former FP editor, RRC journalism instructor Duncan McMonagle. "Hi Jeff", said the email, as Kives' heartfelt assurance from the day before of not being "out to smear" anyone, proved to be about as true as the statement on the strikers website about censoring comments, if what Kives said about that was to be believed. He claimed to have been "slandered" by "somebody (who) sets a poor example for journalism students", and mocked the Kick-FM audience as being inconsequential. Kives also distorted the timeline to Zabudsky, portraying the "attempt" to meet first offered only 36 hours earlier, as "over the past week". 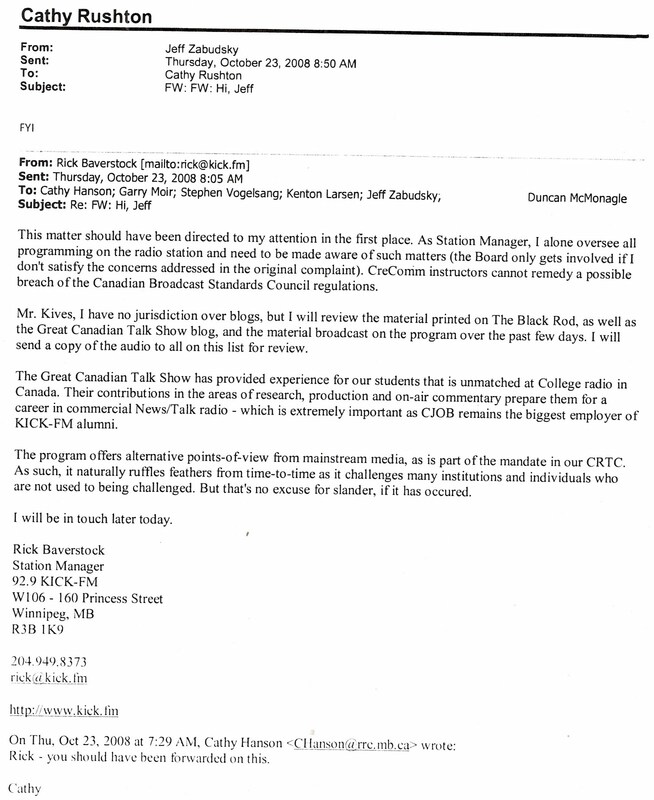 Zabudsky, in his response the next night, firmly set out the distinct independence of the station's "operations and editorial policy" from RRC and said the station had to deal with any issue of broadcast standards. Meanwhile, for reasons unknown, on Thursday morning McMonagle forwarded Kives' attack on TGCTS and the radio station to a number of members of the RRC Cre-Comm Department, even though Zabudsky had made clear the College had no role to play in a complaint about Kick-FM broadcasts. Radio instructor Cathy Hanson received the emails, and recognized that the station manager Rick Baverstock had been somehow left out of the loop. A Board member of Kick-FM, Hanson immediately took the step to correct the situation (an error for which Zabudsky quickly apologized to Baverstock about, as the station manager should have been "the point of first contact"). 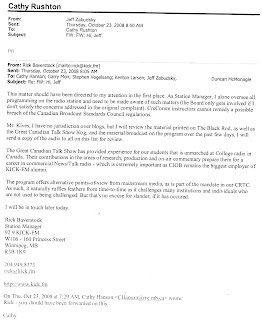 Baverstock then set the record straight, for Kives and everyone else within the College who had been made aware of his complaint, on the important role that TGCTS served for students as an alternative media training ground ("experience for our students that is unmatched at College radio in Canada"), that any so-called "complaints" were to go through his desk ("I alone oversee all programming"), and the station would abide by the rules of the Canadian Broadcast Standards Council -- which had no jurisdiction over blogs. The matter between Mr. Kives and Mr. Gold stems from the story regarding a donation of food to striking Free Press workers by Winnipeg Harvest, or representatives thereof, while impoverished citizens of Winnipeg are in great need of (and seemingly must jump through many hoops to receive) Winnipeg Harvest donations. Richard Cloutier of CJOB is all over the same story, so Marty is not the only member of the media covering this matter. If you believe, after listening, that Mr. Kives has been slandered, please let me know. 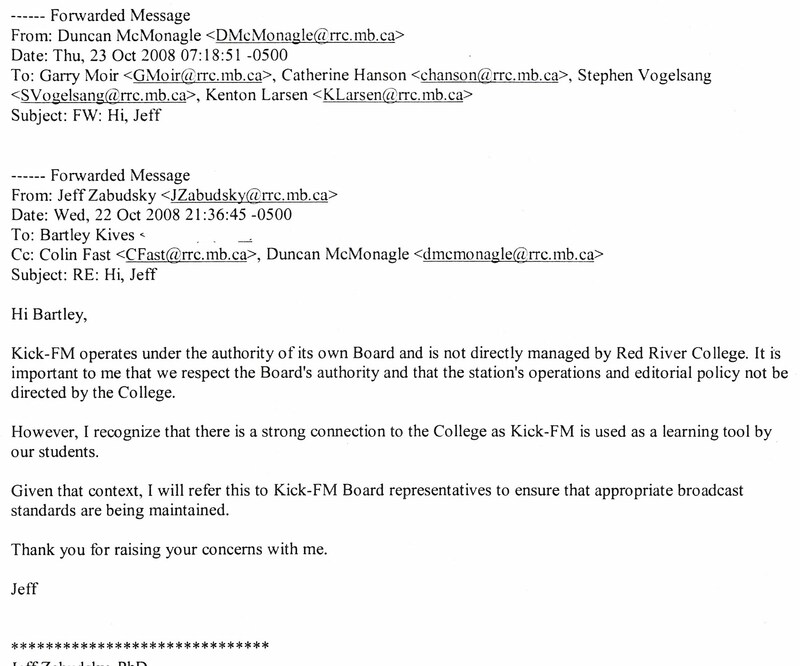 Not one RRC official contacted Baverstock to support Kives' complaint. 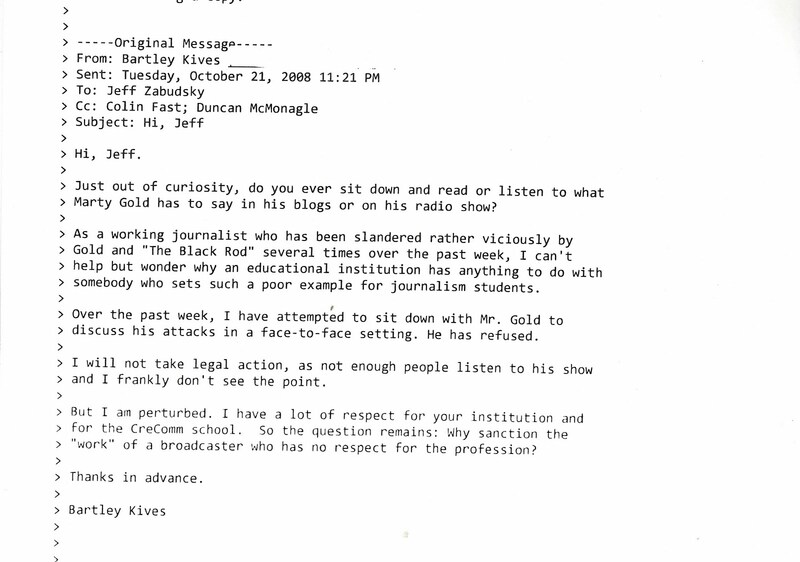 In his own response, Kives insisted he and all local journalists were being "bullied", ranted on about both the show and the station being unprofessional, and refused an offer of ample airtime to voice his point of view. I've listened to the audio, but I need to know exactly which statements you consider attacks. When you let me know, I'll go thru the audio again with a fine tooth comb, and key in on those specific points. I want to make sure I'm not missing anything here. 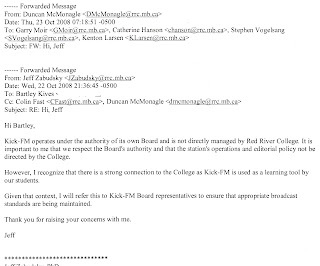 The attempt to pressure Red River College into directly acting to silence TGCTS was stymied because the College president respected true freedom of the press. And because the station manager respected the principle that complaints had to follow due process and be based on facts about actual radio broadcasts. How inconvenient for Bartley Kives. "I frankly don't expect you to do anything about this, and to be frank, I would prefer you didn't even bother letting Kick-FM's board know how I feel. I doubt they would care, as they seem to be fully aware of the extent of the unprofessional behavior. I just want you to realize how much the college's excellent reputation is tarnished ... I want you to be aware of what a black mark this is on Red River College ... I will take this matter up with Kick-FM's Board directly, likely after the current labour dispute at the Free Press is over..."
Specific examples of statements made on-air. Neither did his editor, Margo Goodhand. The difference between the result of the two "complaints" ?